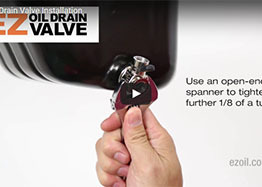 The EZ Oil Drain Valve is an ingenious device that easily replaces your standard sump plug. 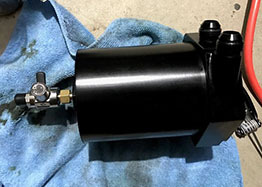 Oil changes become tool-less, mess free and quicker. Easy to adjust oil level if over filled. Easy to take oil samples. • Optional Straight or Elbow Hose Ends. • Will simply outlast your vehicle. • Secure, double-action lever means the EZ Oil Drain Valve will never open under vibration or shock. • Chrome plated ball design means it will never leak. • Teflon seal for smooth operation. • Nickel-plated, brass body for corrosion-free life. • Viton O-ring for a perfect, long lasting seal against your sump. Will my EZ Oil Drain Valve leak? No. The EZ Oil Drain Valve incorporates the “ball valve” design of valves used in pressurised gas applications and will not leak. Every single valve is constructed under precise specifications and pressure tested, ensuring a perfect seal upon factory approval. The EZ Oil Drain Valve is produced in an ISO-9001 certified factory. Will my EZ Oil Drain Valve open up due to vibration or shock? No. 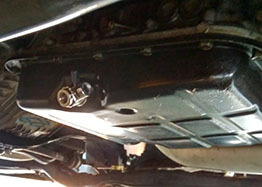 When installed, the EZ Oil Drain Valve only extends about 1.5 inch from the oil pan more than a stock oil drain plug in its closed position. 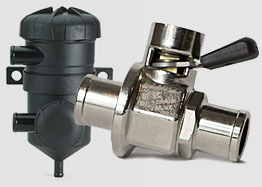 The valve's effective locking system requires a double-action mechanism to open it, preventing any accidental openings. Unlike spring-loaded gate valves, the heavy-duty ball valve construction will withstand any engine vibration. 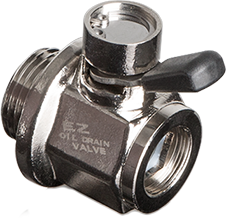 The EZ Oil Drain Valve is constructed out of corrosion-resistant, forged brass, stainless steel, and nickel-plated for added protection from the elements. Brass is the ideal material as it can withstand temperature extremes as well as harsh environmental factors (eg. salt, water, oil, chemicals, etc.). Your EZ Oil Drain Valve will outlast your engine. 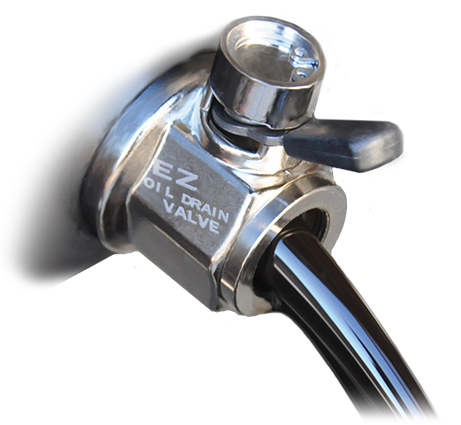 Please go to the Size Guide page to find the correct sized EZ Oil Drain Valve. 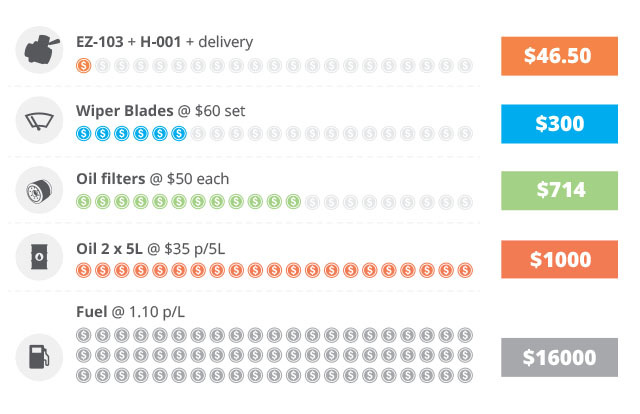 We will soon have a printable measuring chart to help determine the correct size for your application. Feel free to Contact Us for technical help. Yes, the EZ Oil Drain Valve can be used for many applications, including transmissions, radiators, water drain, fuel drain, diesel exhaust fluid (DEF) tanks and many other applications. Please Contact Us for your requirements as we can also custom design for your application. For such a high quality product, you certainly can't complain about the price. $A32.50 small body valve. $A45.00 medium/large body valve. Hose ends from $6.50. Shipping from $7.50. Compare the costs over 100,000km for a Toyota 100 Series Landcruiser 6 cylinder petrol. Don't forget, an EZ Oil Drain Valve is a once only cost. You install it and never have to replace or service it. Genuine wiper blade inserts (drivers, passenger, rear) replaced every 20,000km. Genuine Oil filter replaced every 7,000km with oil change. Premium quality mineral oil (2 x 5L bottles required) changed every 7,000km (some prefer more frequent changes e.g. 5000km). Fuel prices fluctuate, so $1.10 p/L is at the cheap end of the range. We stand behind our product in every way. 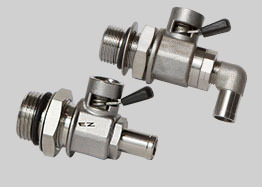 The nature of the ball valve design means the EZ Oil Drain Valve will not leak or fail catastrophically. If for any reason, you are not satisfied with your EZ Oil Drain Valve, return it for a refund. 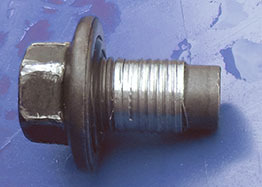 Covers manufacturing defect of any valve, hose end or adapter to the original purchaser. If the item is in stock, we strive to ship on the same day. Express Post option gets to metro areas next day. Regional areas may take longer. What a great product. I wish I'd invented it. I forgot how painful it was to change oil without an EZ valve !! Your service is excellent and valves are fantastic. All my family's cars have them and four other cars I service. So much easier. What a great product and great service. Couldn't believe it got here so quick as things usually take a week or so to get here. Fitted it that night and it's going to make future oil changes a breeze. Will recommend these to everyone. 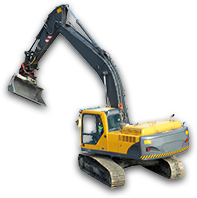 We proudly have a wide variety of valued customers ranging from the DIY bloke to large truck fleet management to generator equipment manufacturers to forklift suppliers. Get your EZ valve now! 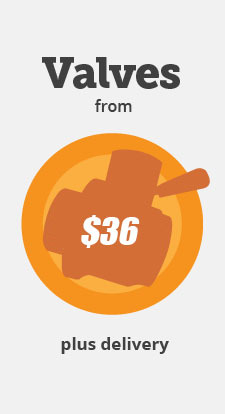 Join the thousands of happy customers enjoying the versatility of the EZ OIl Drain Valve.